Lane Burris is like any other dad. He let his kids try a little bit of everything until they found their calling. For his two boys, and for thousands of other kids over the last decade or two, soccer became their calling – their sport of choice. Over the years, Lane served as a team dad, a coach, and everything else that goes along with supporting your kids and sports. Lane and his boys reaped the rewards – both went on to college to play the game they loved. However, by that time, dad had fallen in love with the game as much as his kids. When his boys went off to college to pursue their soccer dreams, Lane needed a way to fill his soccer void. Before long, he found himself back on the field, following the action as a referee. In less than four years, Lane has quickly earned his stripes. Nearly every week he can be found on a soccer field. From high school tournaments to semi-pro games – even a San Antonio FC or other United Soccer League game – Lane is upholding the rules of the game he loves. Serving as an official can be a mentally and physically demanding task. Lane, a programmer in Enterprise Information Technology here at CPS Energy, primarily serves as an assistant referee. Sure, he only has to cover one end of the 120×80-yard field. But he says he can run as much as four miles in one 90-minute game – just covering half of the field. Serving as a referee is not a mail-it-in gig and an easy extra paycheck. Soccer referees, whether they work high school, San Antonio FC, or World Cup games, are governed by a sophisticated organization that frequently assesses their game performance, monitors their training regimens, and tests them for their game intellect. Lane has quickly made his way through the ranks. He started officiating youth games but has quickly earned the respect of his colleagues. He was named a top 25 referee after his first year. 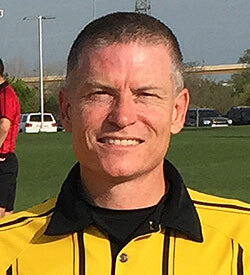 He also has been selected as one of 15 candidates, out of more than 4,000 in Texas, for the National Referee Academy. With higher levels of training, a referee can improve his status and officiate a higher level of competitive soccer. Ironically, Lane never played soccer competitively. In fact, as a kid growing up in McAllen, he only watched soccer when there was nothing else on TV and he caught a game on the Spanish channel. He knew little about the sport until his kids started playing. “I was one of those dads that sat on the sideline and yelled at the referee and told them they didn’t know what they were doing,” he remembers. Today, he sees the game in a whole new way. For Lane, becoming a soccer referee was the right call. Fascinating story…way to go Lane! Can’t wait to see you officiating the World Cup! Whoop! Whoop! Way to go!